The most effective search campaigns all require one essential ingredient: keywords. As the foundation for your SEO efforts, keywords serve as an outline for both your site’s structure and potential content. Capitalizing on different points of entry is a smart way to increase traffic and expand your site’s sphere of influence – particularly because visitors aren’t always going to take the front entrance. For instance, a new study by HigherVisibility took a closer look at five of the most searched terms within six competitive industries to identify trends among the top-ranking URLs. The results revealed that a site’s homepage doesn’t always land within one of the top-ranked spots (e.g. within the wedding vertical, only one query – “wedding dresses” – produced a ranking homepage). In other words, your backlink portfolio should include more than links to your homepage, but how can you identify opportunities to expand your subdirectories? One solution is keyword mapping. For those unfamiliar with this strategy, we will start by looking at how to produce a set of keywords, walk through a basic map template, and identify a few ways in which keywords can also be useful when brainstorming on-site content so that even those familiar with this technique can walk away with at least one new trick. What is a keyword map? In its simplest form, a keyword map is a framework for the keywords you have chosen to target that mirrors your site’s structure. Driven by research, the ultimate goals of the map are to help you discover where to optimize, what content to build, and where you can add new pages to attract more traffic. 1. Begin by using one query to identify a larger set of keywords. Your goal in the first phase of research is to gather as many keywords as possible that you want your site to appear for. Think outside the structure of your current site, and look beyond keywords you currently rank for – specifically those that your competitors are using for their SEO efforts. Given that it is summer in South Florida, I’ll use “Delray Beach hotel” as our example query for this exercise. Using SEMrush, enter the query in the search bar and click on the section that offers “related keywords” (see below). This particular query has more than 780 related keywords, so for the sake of simplicity, we will take a closer look at the top 50. Export these keywords into a spreadsheet (see below). Pro tip: I only left “search volume” and “keyword difficulty” to keep things simple, but SEMrush offers additional metrics like CPC and the number of URLs in organic search results. 2. Group keywords that answer the same question. Once you have your set of keywords, the next thing you want to do is think about searcher intent – the goal being to bucket keywords that answer the same question. Begin by duplicating your spreadsheet and going line by line to pair similar keywords. For example, when we take a closer look at the keywords generated from “Delray Beach hotel,” the first three phrases – “Delray Beach hotels,” “hotels in Delray Beach,” and “hotels Delray Beach” – are all very similar to our initial query. These would make ideal homepage terms, so they should be grouped together. The next keyword is a specific hotel in the area, and after scanning through the rest of the list, I noticed there are several specific hotels that made it onto the list. I grouped them together in red (see below). By the end of this process, I had eight categories, including one miscellaneous group. Pro tip: SEMrush also offers an advanced filter setting that allows users to easily eliminate words they don’t want included. In the instance above, any mentions of a potential competitor like “Marriott” could easily be filtered out. 3. Create potential URLs and bucket keywords accordingly. One of your have organized keywords, you will want to focus on using each set of keywords to help visualize the structure of your site and potential pages. Continuing with the hotel example, create subdirectories based on groups of three or more keywords (e.g. “oceanfront” or “beachfront”). This will help you design a logical path that is both visitor and search-friendly, ultimately improving your chances of ranking for these keywords (see below). Pro tip: If you have already got a site up and running with set URLs, don’t focus on whether or not you’ll need to rewrite any content or setup any redirects – simply ask yourself, “Can my audience use these phrases to find my site?” and rework anything later. 4. Finally, use the buckets to create potential URLs and brainstorm content. One of the best things about keyword mapping is that it makes you think about your pages in terms of themes – helping you distinguish between which words would make great URLs and those that should be saved for something like a blog post or downloadable asset. For instance, let’s take a closer look at the miscellaneous category, where “pet friendly hotels Delray Beach fl” ended up (see below). Although it has a higher keyword difficulty rating, you shouldn’t disregard the phrase entirely. Instead of devoting a subdirectory to it, use it as inspiration for a relevant blog post. Pro tip: For even more content ideas, plug some of the miscellaneous keywords back into SEMrush. Once you have the URL buckets, start piecing your site together in a hierarchy that makes sense. Continuing with the hotel theme, start with the homepage on top followed by subdirectories (see below). After that, fill in each subdirectory with potential content pages (I’ve zoomed in below, so it’s easier to see). 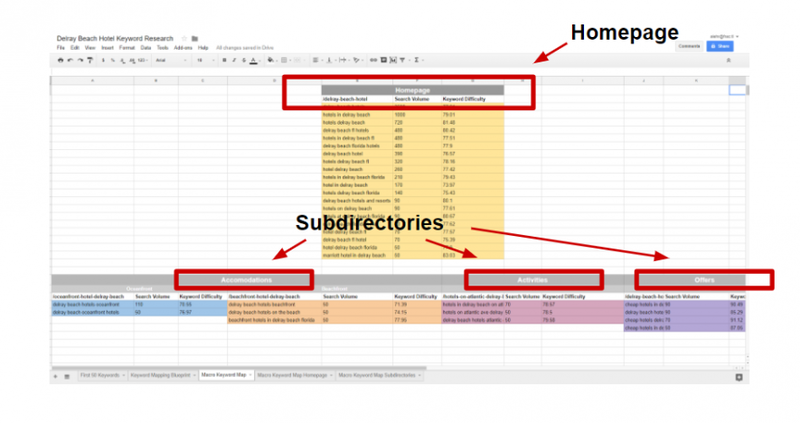 Pro tip: Create new sheets for individual subdirectories to keep things organized and make it easier to view individual pages. Once your keyword map is complete, start producing the more optimized pages you designed – and then set a calendar reminder to revisit this process all over again. Explore verticals you haven’t targeted before or figure out if there are additional questions you can answer for your audience. The mapping process is a great way to make sure visitors are entering your site at a point that provides the value they are looking for – which is something search engines will love, too.